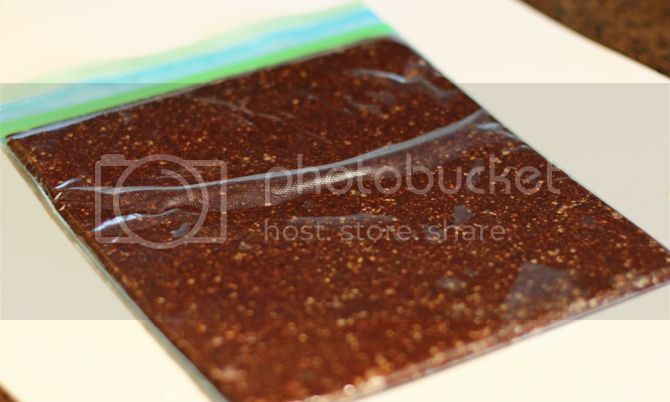 Have you tried Larabars ? They are one of my favorite snacks--but I rarely buy them because they are kind of pricey: a little over a dollar each. After eating my last batch and being sad that I didn't have anymore, I realized I had all the ingredients at home to make them--even dates! Most recipes that I found call for Medjool dates--I had some of those on hand, but have since bought some that are already pitted and I'm not sure if they are Medjool. I have no idea what Medjool even means. Medjool. What a fun word! My favorite flavor is Cherry Pie--so all I needed was dates, dried cherries, almonds... and I added cocoa because it would be crazy not to. 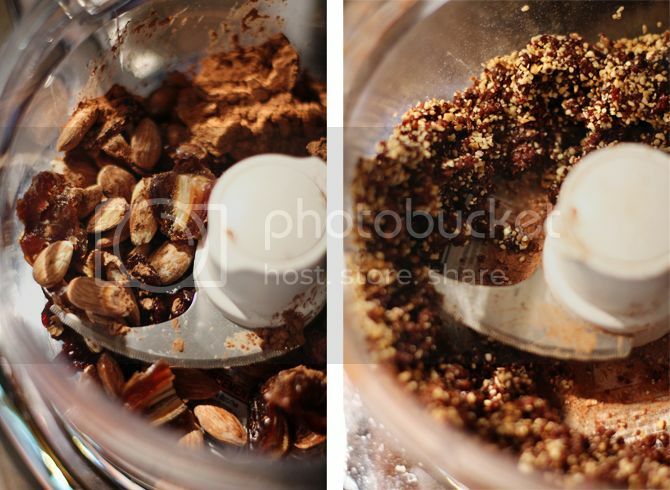 I was only missing one thing to make these yummy treats--a food processor. I used Vic's to make all of Finley's baby food, so I decided I should go out and buy one for myself now that she's gone. Tear. I threw it all in the food processor and whirled it up for a little over a minute. You can do it a little more or less, depending on what texture you like. 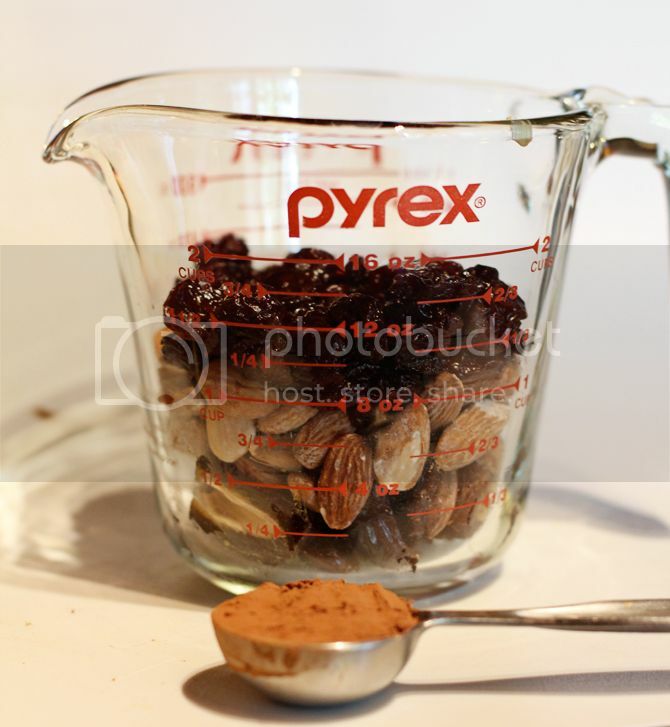 You can also do the fruit and nuts separately if you want to leave the nuts in bigger chunks. Or you can process the heck out of it, that way you don't have to chew. Then I dumped it in a Ziploc baggie and rolled it until it was flat. And cut it into 8 bars. Although you can make them whatever shape you want--roll it into little balls, cut it into cute stars. Or make them boring bars. 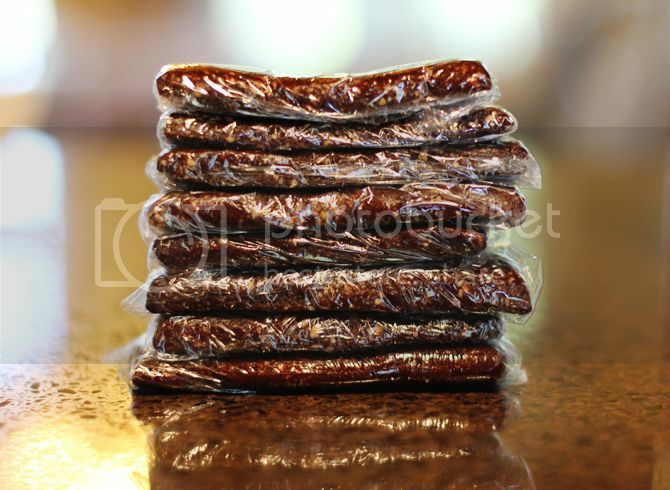 They store for quite a while in the fridge--wrapped up neatly in Saran Wrap. And they are pretty good for you--no fake ingredients! This recipe has 150 cal, 8g fat, 3.5g protein and 3.5g fiber. I feel like that's kind of a lot of fat, but it's the good fat from almonds. Or something. I really am the worst eater on the planet so I have no idea if those are actually good for you. I pretty much eat and then run and nurse and try to not worry about it too much. You can vary the recipe any way you want keeping those basic proportions. I feel like those were actually a little light on the almonds, so next time I'll put in a little less fruit and a little more nut. My other favorite recipe is Peanut Butter and Jelly--you can find the directions here. Basically, you can't make these wrong. As long as you have enough fruit to act like the glue to hold it together, you can put in any type of nuts or fruits you want! Add cinnamon or vanilla... just go crazy. Also--they are delicious crumbled up into oatmeal. Yum. Ok bye. I'm off to do something to keep my mind off the fact that I'm not going back to school right now. Another tear. Yeah, seriously, why are we not back at school together? oh yummm!!!! 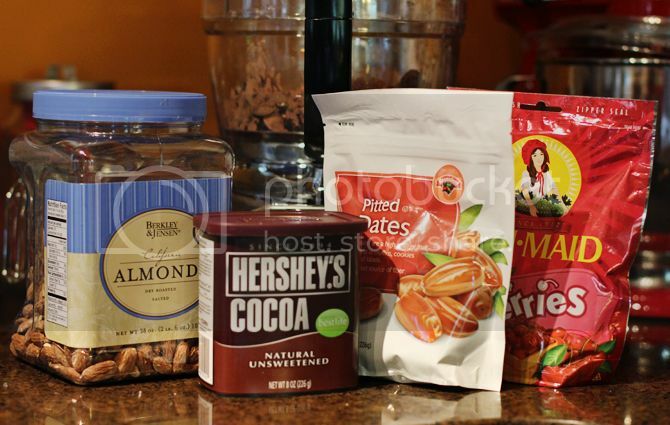 I love to snack on Cliff bars but, because they are so pricey as well, I don't get to often...I am going to try this recipe for sure...I need a cheaper alternative!!!! Thanks so much!!! I was literally just thinking about how you don't blog about food much. I have no idea why I had that thought. They just pop into your head sometimes, you know? So of course, I think I'm very intuitive now that you blogged about food. And, I clicked on your link because I thought it was an actual recipe for PB&J, and I thought that was funny. I don't blog about food because I love it too much to slow down and talk about it. First you take the peanuts and you mash em, you mash em. Then you take the jelly and you spread it, you spread it... peanut... peanut butter and jelly! Qmmm,,,Looks yummy! I love their Cherry Pie ones, too. What a good idea to make your own! It's PEANUT BUTTER JELLY TIME PEANUT BUTTER JELLY TIME. Peanut butter with a baseball bat. ok hello, i'm back on the inter web.